Because we were so tired from our crazy day on Thursday, we took it easy on Friday instead of going to Czestochowa as planned. It was a bummer I didn’t get to make the pilgrimage, but I’ll be back someday. 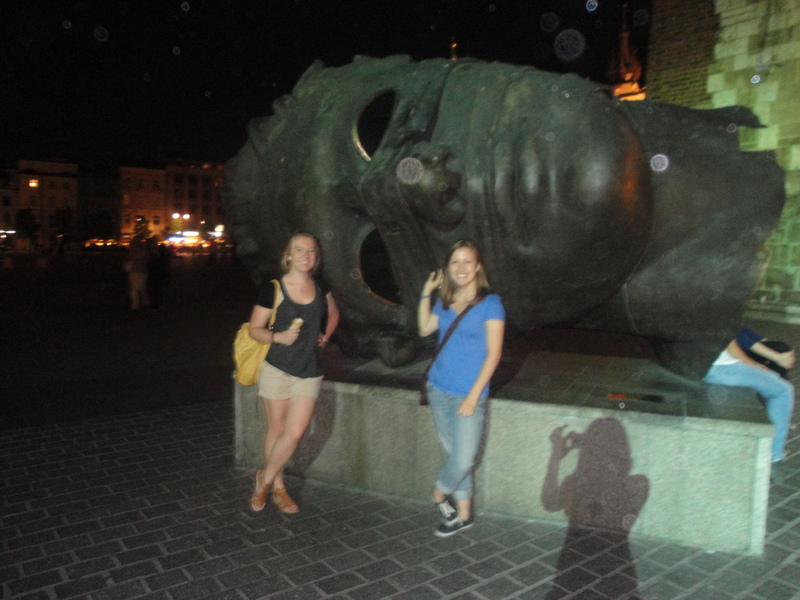 Plus, Niki and I got to spend some more quality time together in Krakow. That really was one of the best parts of the trip… catching up with one of my best friends! 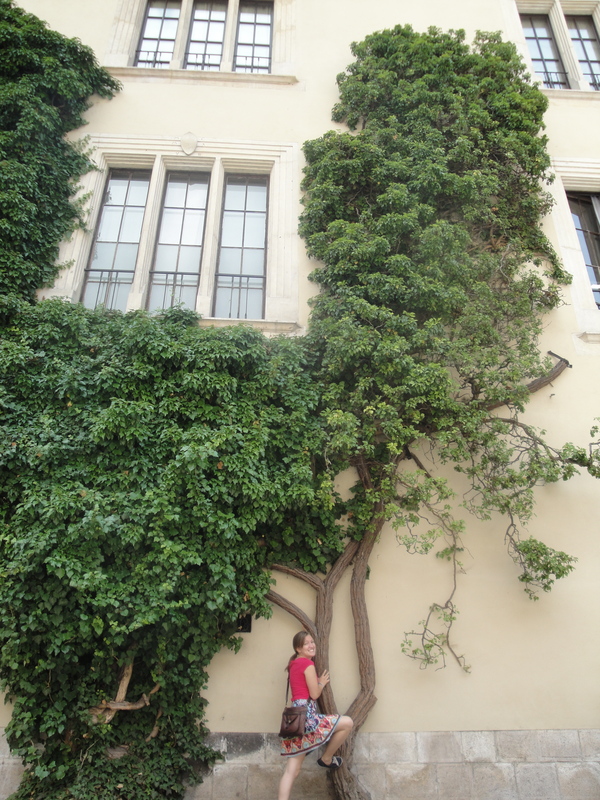 We had lots of long train rides, tram rides, and walks from place to place during which to talk about everything. As we do. This time, because we were in Poland, we ended up talking about our families a lot, but of course then the subject would change to weddings, and then to relationships, and then devolve into our usual gossip and propensity to fixing our friends’ problems. Totally normal. So yeah. 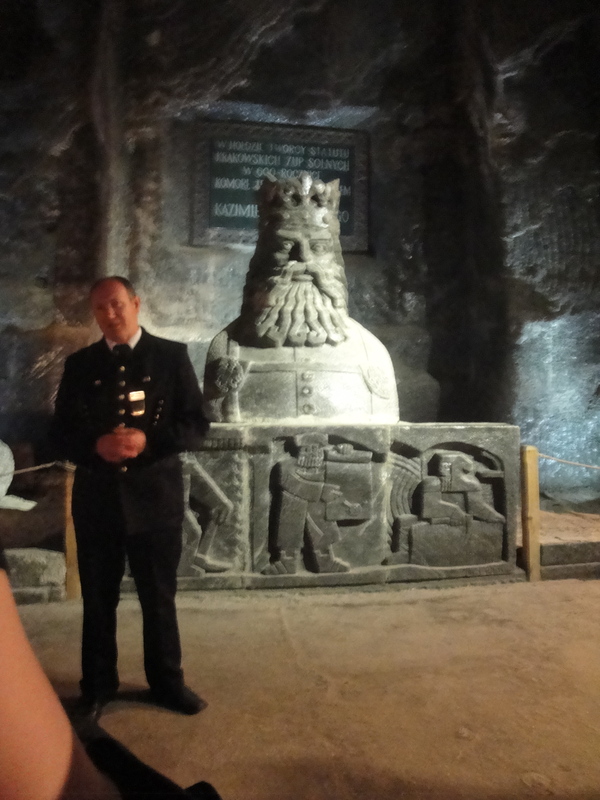 We went and saw the castle, Wewel, up close and personal. The castle is actually connected to the cathedral, so we got to see that, too. 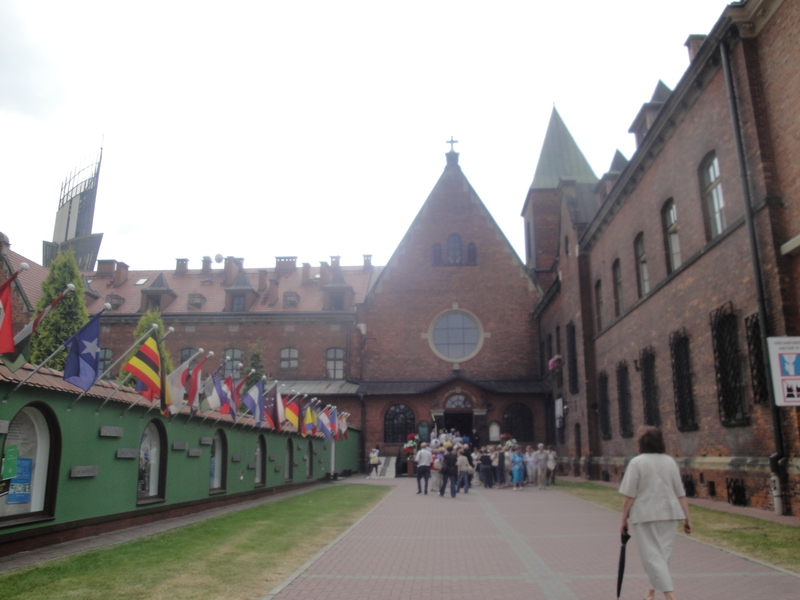 The cathedral is pretty boss… a whole lot of former Polish monarchs are buried there, many of whom are now saints! Including St. Stanislaus. 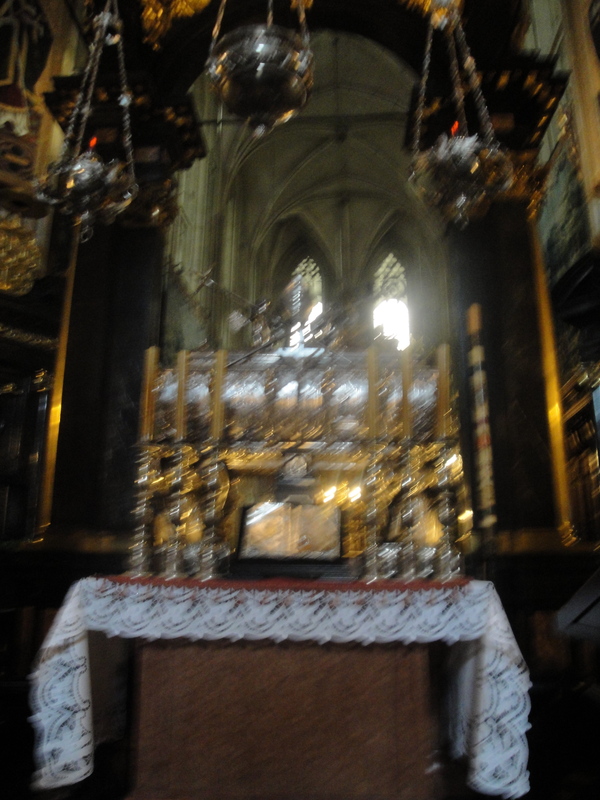 I got to see some relics of his, and also the crucifix which according to legend spoke to St. Hedwig in prayer. I think relics are pretty sweet, and I feel like there is a proportionally greater amount of them in Europe than in the US. I’m sure there are official statistics about that somewhere. We walked around in the main square again so I could see it in the daylight sans bike race, and also so that I could buy presents that my family had so kindly requested that I bring home to them. At this point, we were pretty tired and thirsty, so we stopped and had a drink on the square. I love Europe. For the rest of Friday, we spent time with Niki’s family who continued to cook us delicious food, watched YouTube videos, and took part in ridiculous shenanigans which you can now find on Facebook. 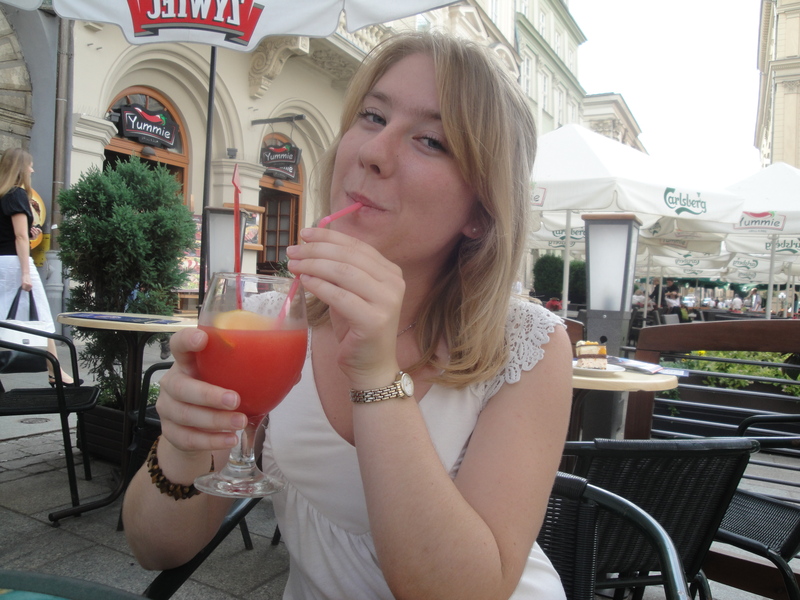 Saturday was my last day in Krakow, sadly. There was one more important landmark which I had not yet seen, but fortunately it is relatively close to the airport, so I was able to go shortly before I departed for Prague. Mrs. Demkowicz drove us over to the Divine Mercy sanctuary, which is built around the convent where St. Maria Faustina once lived and the chapel where she had her visions of Christ and wrote her diary on which the Divine Mercy devotion is based. We were able to enter the chapel, venerate a relic of St. Faustina, and pray for a while there. 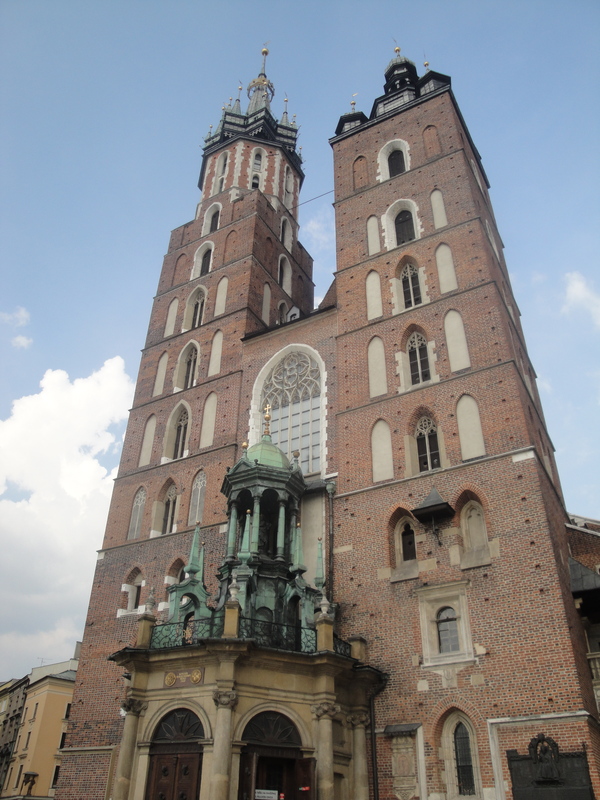 Then, we got to see the newly-built and very modern basilica and the many chapels therein, and we went up to the top of the attached tower and see a fantastic view of Krakow. All in all, a great way to end a fantastic week! In continuation of my current trend of barely doing any schoolwork and being generally irresponsible, I am going to Vienna tomorrow. Stay tuned! 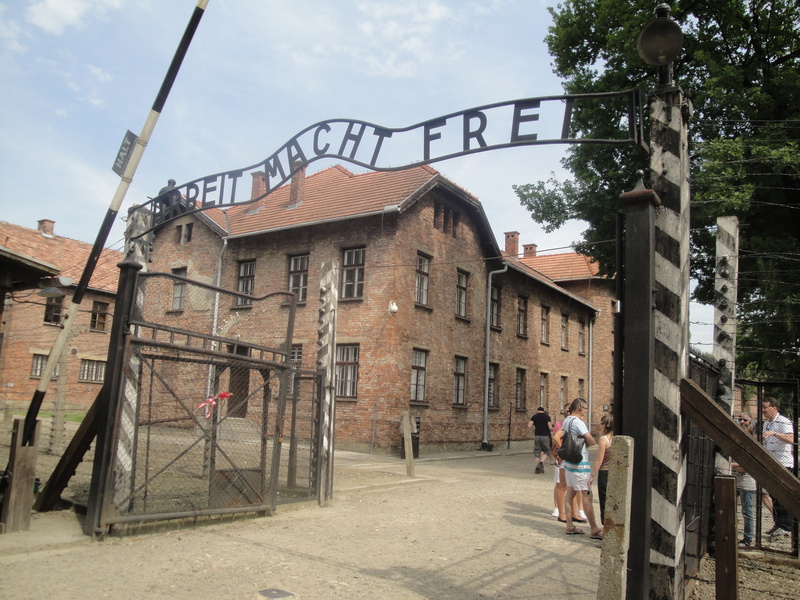 In two consecutive Skype conversations, I’ve recounted my trip to Auschwitz on request. I guess that means people want to know about it, huh? Believe me… it’s a crazy story, so here goes. Since all licensed-to-drive family members were otherwise occupied, Niki and I took the train. Our particular train was really old and rickety, and Oświęcim, the Polish name for Auschwitz, was the final stop, so the train said “Oświęcim”… it is a pretty scary and powerful thing to literally take an old rickety train to Auschwitz. The trip was 1 and a half sweltering hot hours, and once we dragged our sweat-soaked butts into the train station, Niki asked the woman at the desk how to get to the concentration camp. She was kind enough to give us some simple directions, which we promptly botched and ended up at the Birkenau site instead of the main Auschwitz one. This ended up being good, though, because I got to see the (massive) Birkenau camp, which we wouldn’t have otherwise been able to fit into our day, and we got to take a comfortable bus over to Auschwitz. But otherwise, besides the barbed wire, the camp just looks at first glance like a particularly-ugly suburban neighborhood. You can see above that all the barracks are basically just brick houses, and they’re lined up tidily in rows and there are trees everywhere. The true power lies inside the barracks, many of which have been converted into museum exhibits that recall the injustice and inhumanity that this place has seen. The first few exhibits we saw were relatively tame… mostly documents pertaining to the liberation of the camp and prosecution of those responsible. Though there were some recounts of the horrible things done to prisoners, it was all conveyed through documents and forms. But then, in probably our 3rd or 4th building, we walked down the stairs, turned the corner and were immediately met with probably 25 prisoners’ uniforms, propped up so they looked lifelike–like people were wearing them. It was absolutely insane and really drove home the point–people used to live here, except you would never know that they were actual humans from the way they were treated. We got to see a room in the barracks outfitted like it would have been at the time–some of them just had straw on the floor, or the thinnest blankets, for the prisoners to sleep on. Many of the hallways were lined with pictures of the prisoners, labeled with their names, ages, occupations, and prisoner numbers. If that doesn’t give a sense of humanity to the Holocaust, I don’t know what does. It really struck me how young some of the prisoners were… one of them that I saw was only 19 when he entered the camp and 20 when he was killed. That’s how old I am! The emotional/traumatic high point of Auschwitz is definitely the Material Evidence of Crime exhibit. It has huge glass cases full of things collected by the guards upon the prisoners’ arrival: shoes, glasses, suitcases, artificial limbs, combs. I’ve never seen so many shoes in one place in my life. I’ll never forget walking into the first room. There’s a huge glass case filled with… something… it takes a little while to figure out what it is you’re actually looking at, and then you realize… it’s a huge mound of human hair. A fraction of the hair collected after shaving all of the female prisoners’ heads. It weighs several thousand kilograms and scientific testing found traces of the chemical gas used in the extermination chambers in it. Not to mention that, in the same room, they had displays of blankets that the Nazis made out of the hair that they collected. It truly was a testament to the cruelty and downright inhumanity that occurred at concentration camps like Auschwitz. We saw several more exhibits on daily life at the camp, and then we came to the Death Wall, where many prisoners were executed due to things like accountability for escapes. There are little memorials at the wall itself to those who died there, and the very next building was the Death Block, where prisoners were kept in a variety of manners, but all for a common purpose: their eventual death. One of the cells in the Death Block was the one I most anticipated seeing: the starvation chamber. That probably sounds funny, that I looked forward to seeing the starvation chamber, but one of my personal heroes died there in the act of saving another man’s life. 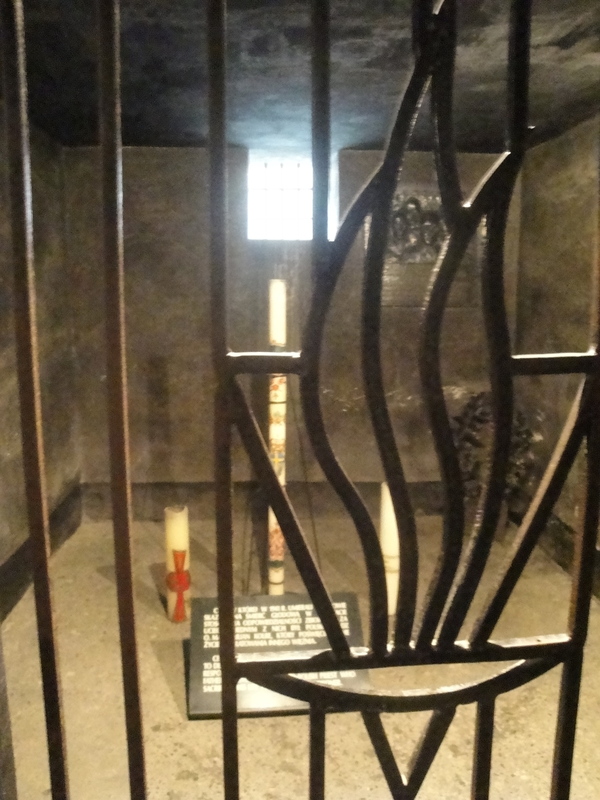 The next room in this building also contained Maximilian Kolbe’s rosary, some of the Communion hosts that he and his fellow priests snuck into the camp so that they could continue to celebrate Mass, and an elaboration of his story. Since this was one of the last buildings we went to, it was really wonderful to see how God works for good in even the most horrific, terrible places. Once we finished looking around and reflecting on the gravity of this place, we made our way back to the train station, where we were promptly hit on by some (either quite drunk or extremely friendly and delusional) guys who wanted to know if we were going to the beach with them. Considering that there are no beaches anywhere near Krakow (and that these guys were seriously creepy) we got on the train back to the city instead. and lots of other cool stuff too! 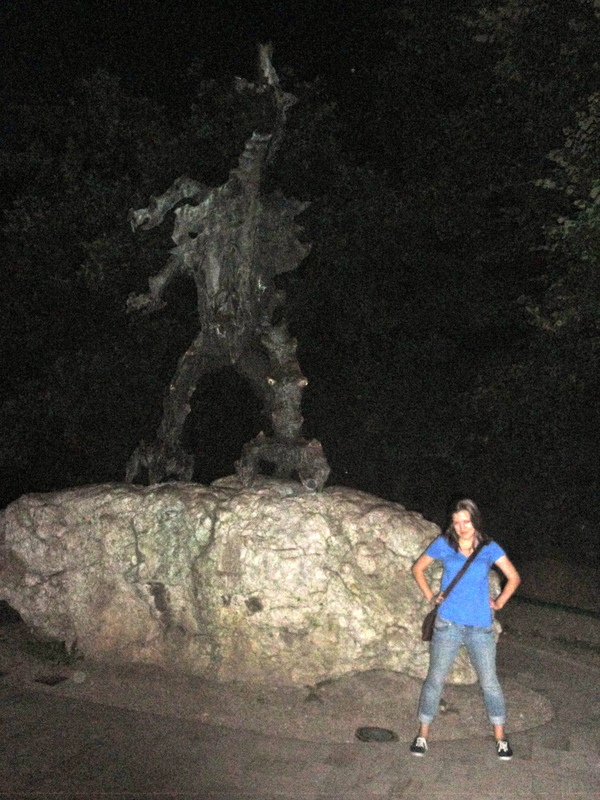 Krakow is a magical city! When we’d finally had enough of our nighttime wanderings, we headed back to the main train station only to find out that it had closed for the night, so instead we found another tram stop for what we thought was the other appropriate line to get us to where Niki’s parents were supposed to meet us. Turns out the routes change at night, so we shortly found ourselves getting kicked off the train at the end of the line, not knowing where we were and unable to get in touch with anyone but Niki’s sister, Marynia, who was conveniently in Austin. Luckily, through some miracle, they found us and we got home safe and sound… but not before a few moments of anxiety! Strangely, I think this was my favorite day of the trip. You know… despite the multiple times we got lost, and the fact that it included a concentration camp, and getting stranded in Nowa Huta… but I guess that’s how memories are made. On Tuesday, I flew through Prague to Krakow. I had a pretty long layover in Prague, which was frustrating, because it wasn’t a long enough time to actually leave the airport and see any of the city, but it was way too long to sit in the airport without getting bored. I settled for having lunch at one of the restaurants in the terminal and window shopping. That evening, even though several of our party were suffering from jetlag, Karolina, one of Niki’s cousins, took us on a tour of Nowa Huta, the section of Krakow nearest to the house. This is a neighborhood that was “created” by the communist regime as the “model community.” It’s impeccably organized into blocks of identical apartment complexes, each of which had their own school and all the other amenities needed for a living community. Perhaps because the communist lifestyle and oppression were so apparent here, it was also a place of great unrest during those days: it saw many protests and marches, some of them violent. Now, one of the main streets there is named after the Solidarity movement, which helped to break the iron grip of communism, and another is named after John Paul II, who as archbishop of Krakow was instrumental in the movement. 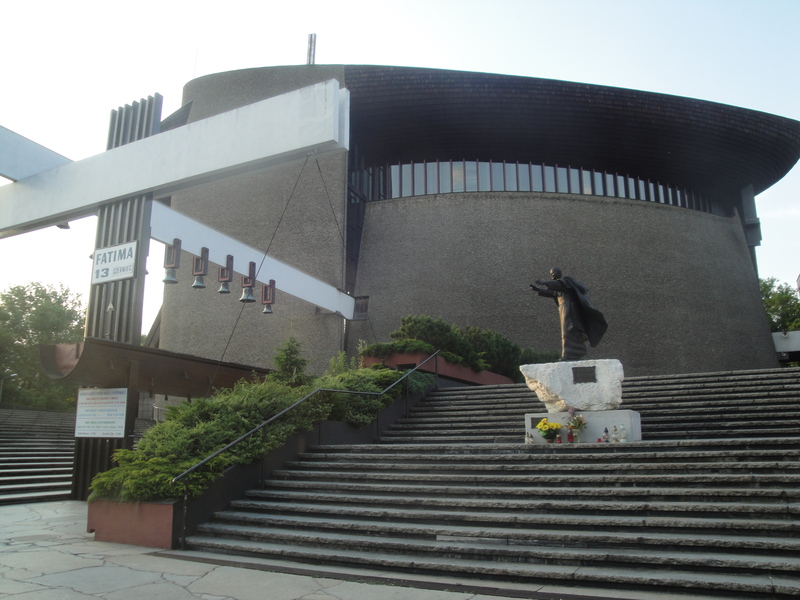 One of the coolest parts of Nowa Huta is the Catholic church there, which looks like Noah’s Ark from the outside and was built as a joint effort of the universal Church. Since there was such resistance from the regime against the idea of any church being built within the “model” atheistic neighborhood, even after permission to build the church was granted, no materials were supplied by the government. Since the government was really the only source of such materials, Catholics from around the world sent stones and other building supplies to help the Catholics of Nowa Huta build their church. 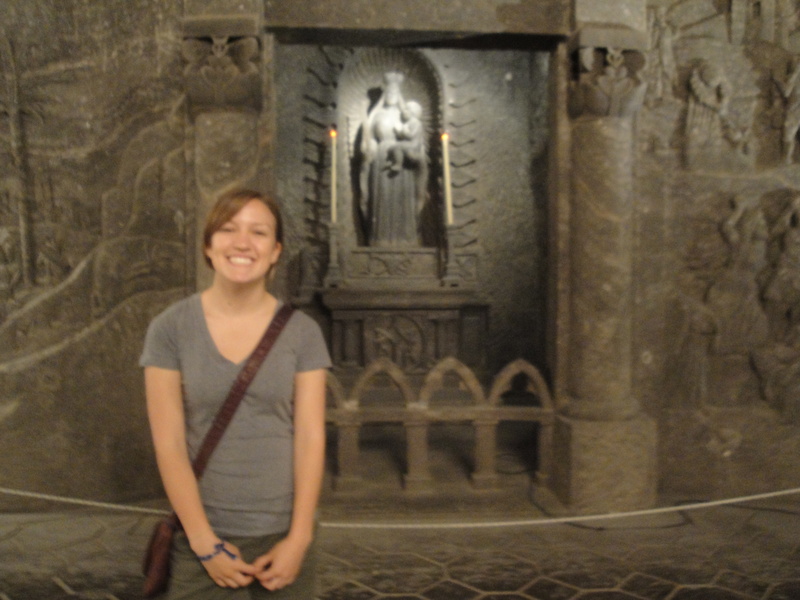 After a good night’s sleep to kick jetlag and sickness, Niki and I headed to the Wieliczka Salt Mine, one of Krakow’s biggest tourist destinations and historical sites. A tour of the mine takes you to 3 different levels of the mine, up to 100 meters underground, and is about 2 hours long, but the really crazy thing is that the amount of the mine we saw during those 2 hours was only 1% of the mine’s total area. It’s absolutely insane how big it is! We wrapped up our tour with a Polish lunch (food was a recurring theme of this trip) and then headed into downtown Krakow to meet up with two of Niki’s cousins. We saw all the sights in old town… well, most of them, and kind of from a distance because of a weird bike race that was going on in the square. 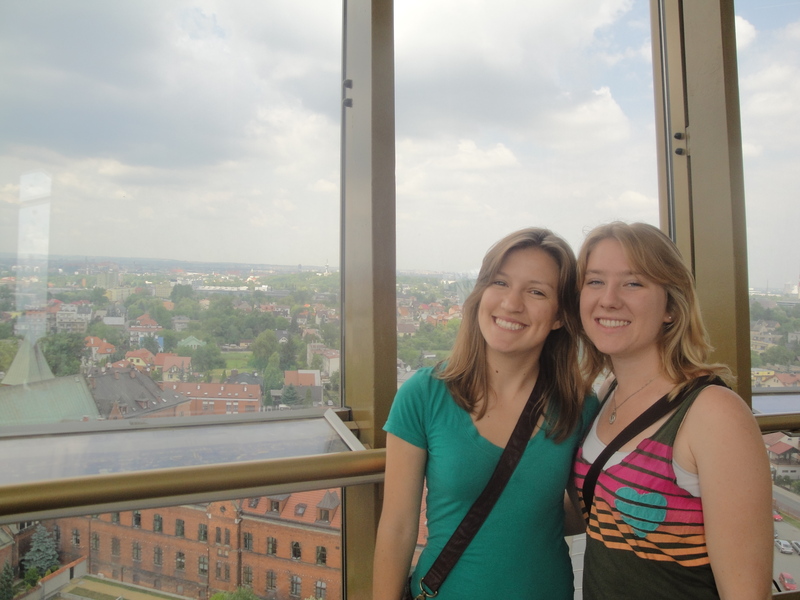 But still, I saw Florian’s Gate (one of the old city gates), the Basilica (whose spires don’t match at all), Jagellonian University (where Nicolaus Copernicus studied), St. Ann’s church (where Niki’s parents were married, all her siblings were baptized, and her sister got engaged. Oh and it’s named after a pretty baller saint too), the cloth hall (where all kind of vendors sell their wares daily), and a bunch of other sights on the Main Market Square, the biggest of its kind in Europe! On our way back to the train station, we stopped at this fancy little chocolate store and treated ourselves to drinking chocolate, which I’d never tried before but enjoyed immensely! I had white chocolate with strawberries. Mmmmm. The legend behind the two differing towers involves family intrigue, betrayal, and the use of a knife that now hangs in the cloth market across the square. Back at the house, we enjoyed a Polish dinner with the rest of the family, including some more aunts and cousins I hadn’t met yet. Afterwards, we all headed out to the backyard (thanks to the prompting of Dr. Demkowicz) to pick some ripe cherries from the cherry trees. This ended up being a pretty hilarious (and delicious) undertaking. It’s kind of funny to watch how different people pick fruit. Some like to get as many as possible into the basket, without stopping to eat any, while others adopt a “one for the basket, two for me” approach. Either way, the cherries were delicious.